Author is coming to Nashville. Hey, American South, look what is happening: A new cuisine is emerging, born of Southern and Latino cultures. Tamales stuffed with greens, corn ice cream topped with hot praline sauce, brownies with chile, sweet potato and plaintain casserole. Welcome to El Nuevo South. The ingredients of our people are joyfully intermingling with traditional Southern staples and celebrated in a new cook book, The New Southern-Latino Table: Recipes that Bring Together the Bold and Beloved Flavors of Latin America & the American South, by Sandra A. Gutierrez. The 150 original recipes explore the melding of cultures, ingredients and cooking techniques of more than 20 Latin American countries with that of the traditional American South. We can only say Wepa, Y’all, to that. 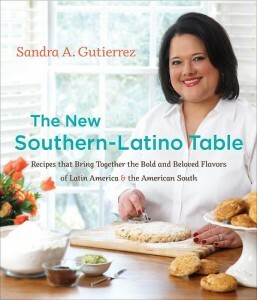 You also can connect with Gutierrez at her site, Sandra’s Kitchen Studio, and on her Facebook page. 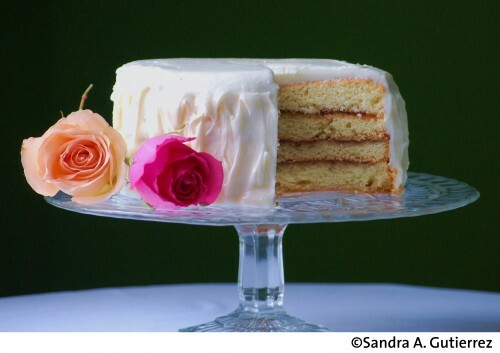 I leave you with this image of Guava Layer Cake with Cream Chese Frosting from the book, an image that made me dream of los bakeries in Miami and made me believe I can make this Cuban- and Southern-blended cake for my own daughter, a Cuban-ish girl born and raised in the American South — a perfect melding of cultures. Like the recipes in the book. From "The New Southern-Latino Table: Recipes that Bring Together the Bold and Beloved Flavors of Latin America & the American South." by Sandra A. Gutierrez. Used by permission, University of North Carolina Press. Tags: cultura, El Tiki Tiki, Viva Nashville!